Kobie Boykins: Tonight what we are going to try to do... we are going to take an exploration, an exploration of the planet surface of Mars. And we are going to look at that planet through the eyes of Rovers. 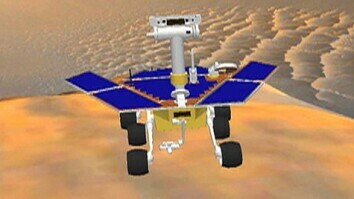 And the first Rovers we're going to talk about are Spirit and Opportunity, the two Mars Exploration Rovers. And then we're going to switch into Curiosity. A larger Rover and its job is to do something a little different. But first we have to go back in time. We're going to back approximately 10 years, a little bit more than 10 years. And we're going to discuss what happens and how Spirit and Opportunity made it to the surface of Mars. So, we're going to fly over to Kennedy Space Center in Florida and we're going to go and we're going to get real close and personal with the Delta II rocket. Now this is the Delta II rocket, it's built by the Boeing Company. It has three stages to orbit. And around the bottom side of this vehicle there's nine air-lit solids. So this is going to help us get a little bit extra lift, so that we can get to Mars as rapidly as possible. And if you don't mind counting down with me. “Five, four, three, two. Begin ignition.” And lift off of the Delta II rocket with the Mars Exploration-- And in a minute and 30 seconds we're in orbit around Earth. As you see, we're starting to drop away some of the air-lit solids. Once those air-lit solids fall back away they get recycled. They get picked up. Once out first stage burns out, we're going to let that go, we're going to light our second stage. Once we light our second stage then we let that first stage fall back to the ocean, it becomes an ecosystem for the fish. We light our second stage. At this point the spacecraft has very little stability, so we are going to spin it up. We spin it up to about 12 RPM, more or less like a quarterback that throws a nice, tight spiral. We are going to get really good flight through the air. We light our third stage, this puts us on a direct trajectory to Mars. We are going to do what we like to call quiescent period. The boring period of travelling through interstellar space. Okay. So now... Seven months later, here we are travelling at 16,000 miles per hour toward the surface of Mars. We lose our cruise stage because we don't need it any more. It has pointed us directly at Mars, we are ready to go and we are going to hit our landing site. We are travelling at 16,000 miles per hour and we hit the upper atmosphere of Mars. When we hit the upper atmosphere of Mars, the friction as we come through literally burns a hole in the upper atmosphere. The heat shield in the front of our Rover gets to about the surface temperature of the Sun 1600 degrees centigrade. At this point we're going to start what I like to call reverse origami. We're going to pull up a parachute, this is a supersonic parachute and that's going to start changing our angle of attack from being directly in to being more vertical with the surface of Mars. At this point we're going to slow down to around 300-400 miles per hour. We are going to lose our heat shield because we don't want that heat to come back into our vehicle. We are going to lower our lander more or less on a shoestring. Once we find the surface we blow up the airbags. That takes about the blink of an eye, about half a millisecond. And then we're going to fire some retrorockets when we get to about 40 meters above the surface, slow down to zero miles per hour cut the cord and bounce. And we bounce... and we bounce. Now the first bounce of this vehicle could take us over, I use, the Empire State Building. We can bounce anywhere from a mile and a half to two miles. Each successive bounce is taking away a little bit of energy, which slows us down. After we lose all of our energy and we come to a stop, we are going to deflate the airbags. So the vehicle senses that we've stopped we deflate the airbags. What you saw happen in a few seconds there takes about 45 minutes in real time. The next thing that we're going to do is we're going to open up our lander petals. We are going to open up these lander petals now, what you're going to see happen in about 30 seconds happens in 45 minutes. The next thing that we are going to do we are going to open up the solar arrays. If you don't mind, I'll watch too. Ah! We've got one more thing to do. Just one more part. Okay, just... ooh... once it gets over center, ah, okay! Well done. I must have seen this a thousand times, it doesn't matter how many times I see it, I get very excited when it works. Because my team and I were the team that designed that and if it didn't work we had a very, very bad day on Mars. So, when it works I get a little excited. So, open up the solar arrays, now we can power the vehicle. We are starting to charge up the batteries. The last things that you are going to see happen on this first day is we pull up the Pancam mast, what we call the PMA. And we deploy our high-gain antennas, so we can talk directly back to Earth. The last thing that you are going to see the Rover do in this animation is it's going to take a panoramic image. One of the things that you want to do when you've landed in a new place is find out where you are. So we are going to take this beautiful image, we're going to start transmitting that back to Earth. So the next day what we're going to do is we're going to stand up the vehicle. Deploy the front wheels, and we're going to change more or less our perspective on the surface. When we designed Spirit and Opportunity, we designed the eyes to be at 5-foot-2. That's approximately the level of a human being walking on the surface of Mars. So, now when we take images and we get our panoramic images, it's going to feel like a human being was standing on Mars looking around. We are looking for scientifically exciting sites. Spirit and Opportunity are roving geologists. Their job was to follow the water, to look for water that may have flown on the surface of Mars. And we are going to do that through the history of the rocks. Go up taste the rocks, touch the rocks, feel the rocks, if you can break the rocks. Try to figure out do the rocks tell us something about the history of Mars. It has all of this great stuff, it starts recording everything that it's doing, all of it's maneuvers, it records all the things that are felt, all the bounces on the surface, everything, everything... eight days later drives off, touches a rock and it's memory got full. And once its memory got full, the computer wouldn't boot up. And we actually told it to erase it's memory, threw all of that stuff through quiescent space away. And then, “Hey, here I am all happy. Do whatever you want me to do.” Do the rock. And then Spirit became okay Spirit and Opportunity were, I'll tell you, they were designed to go to the surface of Mars and explore the surface for 90 days. And travel up to 600 meters. Spirit was on the surface communicating for more than five years. Traveled a little less than five miles. Opportunity, the good sister landed a month later, has been on the surface for over a decade and continues giving us great information daily. And she's traveled over 25 miles. So, why do we go to Mars? Why is Mars such an interesting place to explore? In the image that you see behind me on the left is Mars. And on the right is Earth. Looks like where river or water may have run at some point in time. In this image, I have switched it around. On the left is Earth, on the right is Mars. That image on the right is the largest known volcano in our solar system. The rocky planets, it's called the Olympus Mons, it's on the surface of Mars. It's approximately the size of the state of Arizona. Go back to the early 70s, 76-77 when we landed the Viking landers on the surface of Mars. We have Mars Pathfinder, which landed in July 4th of 1997. And then we had Phoenix. And then you have the two landing sites for Spirit and Opportunity, in this topographical map. Let me show it in a different way. For those that like planetary maps you can see where we landed. And the other thing that you'll see in this is the yellow places are the places that we've landed, the ones in white were the possibilities for Curiosity to land. So, now we're on the surface. Spirit and Opportunity caught some very interesting things on the surface. From orbit we could see things that look like large tracks, long tracks on the... on the dust, the surface. And we always postulated that they would have to have these dust devils, but we had never seem them. We believe that this is one of the reasons the vehicles have lasted so long. Every so often when these dust devils would come by and clean off my solar arrays... and make us happy and we make more power and now the Rovers can continue to do their science. Very interesting. Scientifically this is one of the most important images that we took with the Opportunity vehicle. It was the first time ever remotely with a robotic vehicle that we took an image on the surface at the exact same time we took the image from orbit. So, now we can actually do atmospheric science from the ground and from orbit at the exact same time. So, with Opportunity, the good sister, it travels 300 million miles, bounces along the surface of Mars and lands in a crater. There's nothing there, it's just nothing, except one rock. And the rock is not from Mars! It's a meteorite from somewhere else. Now, the interesting thing is we've seen quite a few of these now on the surface of Mars. We do know that they are from one of the four rocky planets or some of the asteroid belt, we do know that. But where they are actually from we don't know, okay. They probably were around sort of the early formation of the planet. But we don't know. But they are very interesting. Very exciting. The Rover is now here in Endeavour Crater. It's been exploring Endeavour Crater for at least a year now. We've driven down into the crater, we are at a new location inside the crater. We are seeing a lot more of these clays, right. So now we know that in this location all across the Meridiani Plains there's a lot of water. Deep water. We see the change in salinity. Same thing for Spirit, as we drove up Husband Hill we started to see this change in salinity in the soil. It was a failure that actually told us that. One of the wheels on the Spirit Rover stopped working and so we started dragging it. And by dragging it we created this trench on the surface of Mars. And as we were creating this trench when we turned around and took images we saw the actual albedo, the light that was coming off the soil change. And that started to tell us something is going on so we started doing more investigation. And we saw this salt level change as we started to get higher in elevation on the mountain. And what it means is that as the water was receding it got much more salty and that told us that there was water there. Very salty water and there was water at both these locations. So now we know that Mars was a very wet place at one point of time in the past. We are going to change gears and talk about Curiosity a little bit. Curiosity was launched on November 26th 2011, and landed August 5th. We've traveled for 9-point... 9-point-4, 9-point-5 kilometers on the surface as of Saul 774. 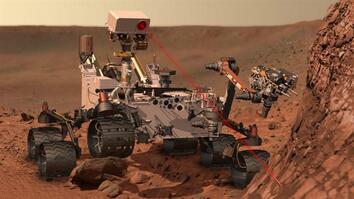 Curiosity was designed to drive 20 kilometers and be on the surface for one Martian year. So, we've already made one Martian year, so we've already made part of our prime commitment to NASA and that... it's been awesome. It's been an awesome couple of years. Now how did we get there? So it's a little different. Very, very similar launch sequence but it's a different launch vehicle. So instead of a Boeing vehicle, this is a Lockheed Martin vehicle. It's called an Atlas rocket. It's built by Lockheed. It has really just two stages to orbit. So you've seen we've already got into orbit, you saw that particular part. Now, this second stage of this vehicle is much more capable. It has some retrorockets on it, it has some thrusters on it. Now it can spin us up and it can point us directly at Mars. So we did the last kick, and then that's going to fall back and burn up in the atmosphere. What doesn't burn up becomes ecosystem for fish. And now we are going to start going around. So now we are on a direct trajectory to Mars. You are going to see us light up the solar arrays that are around on the cruise stage. That's going to actually charge up our batteries and then what we do is, we supercharge the batteries and then we discharge them and we keep them at about 80 percent the rest of the way. Now we are travelling a little bit slower because we don't have the same lift capability with the Lockheed vehicle. So we are travelling at 14,500 miles an hour. And it takes a little bit longer because Earth and Mars are at different orientation. Deploy a parachute again. We are going to lose that heat shield because we don't want to get that heat soak coming back into the vehicle. But now everything is changed. We lose the heat shied and instead of... lowering a lander with airbags we are actually going to cut some cables and bolts, more or less and let our Rover fall toward the surface. Fire up some rockets and fly. We added a new science instrument called the Marty Camera. This camera is actually taking images at about 32 frames per second. So we are going to zoom in on the camera and you're going to look at what's going on. So as we are falling toward the surface the camera is taking images of the surface of Mars, overlaying them, figuring out what is our downrange trajectory and velocity, and if there are any obstacles that are in the way. Once we figure out there are no obstacles in the way, we are going to lower our Rover on three shoestrings and an umbilical cord. Really gingerly hit the ground and once we sense slack in the cables. The cables go slack, we cut the three umbilical cords and the descent stage fires up and flies away. Designed to go 600 meters away from the vehicle. It would be bad if it came back and crashed on us, that would be really bad. Now we are on our wheels. We are ready to start exploring. So now instead of having to drive off a lander, we are ready to go the very first day. Last things that we have to do is pull up our remote sensing mast what we call the RSM and pull out our high-gain antenna. The high-gain antenna for this vehicle was delivered to us by the Spanish as a gift... to NASA. Last thing you are going to see here is as we start driving around with Curiosity is that Curiosity is a different vehicle. Instead of being a roving geologist, it's a roving biologist. It's job is to look for past places on Mars that could have sustained life. We get to shoot a laser at the rock. Now why did we do that? Instead of having to go over and touch every rock and taste every rock... like we said before, we can actually fire the laser at the rock, burn the surface of the rock and look at the gas that comes off. And from that gas we can see what the chemical composition of that rock is. What are the elements that are there. The other thing that we did with Curiosity is we added a drill. Now this is the first time that we will be able to drill robotically on another planetary surface. Now we have drilled before with human beings on the surface of the moon. Anyway what we are seeing here in the video is what we call x-ray florescence. We are actually shooting x-rays through the rocks, we agitate them and we can see how the actual chemicals are held together. What is the crystalline structure and that actually tells us a lot about what's going on with rocks on the surface of Mars. Some more of the testing that we've got and here what we're going to do is, we're going to show the mobility system. The mobility system is very similar to the mobility system that we had on Pathfinder and the Mars Exploration Rover. Right. It's the rocker-bogie suspension system that we've used on all of the vehicles that we've had on the surface. But this one serves a different purpose. It actually is our landing gear. So, the wheels that look like they are one monolithic structure of aluminum, they are not. They are about seven sheets of paper of aluminum on the outside shell. But in the middle it's titanium and the titanium is there to give us sort of a spongy, flexer feel. You are going to see us doing some testing. We are driving over obstacles that simulate what we believe we are going to get to on Mars, about 35-centimeter height obstacles. We tilt the vehicle to driver over different surfaces, we drive on the surface. We have six-wheel drive, four-wheel steering. So, all six wheels of the vehicle can drive, and all four wheels can turn toe-in about 90 degrees. So we can actually turn about our center of mass. So if we wanted to turn in place we actually could. The vehicle has a top speed of five centimeters per second. It's boogieing. It takes us... I'll tell you what-- It takes us 45 minutes to do a football field. That's how slow we move. So it's really, really slow. Now, when you are 300 million miles away from the nearest gas station, it's okay to go slow. Where did we go on the surface of Mars for Curiosity? Curiosity went to a place called Gale Crater. So, why did we go to this Gale Crater? The reason we went to Gale Crater is that... we wanted to investigate this place called Mount Sharp. And Mount Sharp is this very, very large mountain. It's 5-point-5 kilometers in size and what we are looking for is the different layers as you drive up the mountain. So, we are going to land, drive to the mountain and then look at the difference, they say clays, we'll just say it is time periods. So, early time period to later time period as you drive up this mountain. Trying to see... can we see places on the surface of Mars that once could have been habitable for life. Could Mars in this location, around Gale Crater, sustain life and does it have the building blocks, the basic pieces to actually have life grow in that location. Then we got some of the first images back. So this was actually... after the first drive. And you see the name Curiosity. After we got to the surface, we started taking selfies. So this is one of the first selfies of the Rover. It's a shadow, we weren't really good at it yet. Then... Somebody had some fun with one of our images. Optimus Prime came and visit us... So... That's fun. We have a laser. So great, we have a laser. Here's what people think we do. Sort of fun. Here's what we really do. So, you have the picture on the left, undisturbed soil picture on the right, five laser holes. I'll show it to you a different way, I'll show a video. So, here's a video of us burning a hole in the ground. Pretty exciting, you can see sort of the by-products coming off. You can't see the gas. But what we are actually doing is we're burning a hole, looking for the gas so we can tell what it's made of. So, the first thing that happened after we got-- after we landed we drove to this area on Mars that was very interesting. Within the first three months of being at this location, we were able to say, one, Gale Crater was wet. Number two, it can sustain life. Now we can't say that there was life there but we can say that if there was, it would have been able to be sustained. There are all of the chemical compositions that are needed to support life. Paying homage to some of our great explorers before us, footprint of Buzz Aldrin and then Curiosity Rover footprint. Our first scoop, so we now went down and we scooped up some of the dirt. We are going to actually take that inside the vehicle. Some more of these analogues. So, looks like riverbeds. 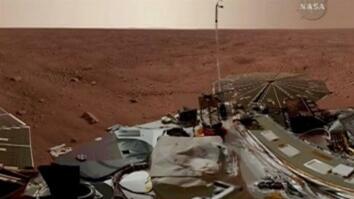 Picture on the left is uncorrected, just an image that comes back from the surface of Mars, looks like a riverbed. You can see false cover image of Mars that's sort of in the middle and then an Earth riverbed. Looks very, very similar. Here is the first time we are going to sample, we are going to drill into the surface of Mars. I can tell you this took a long time. It took us about four weeks to actually make this one little hole. Here's a picture of the hole up close. The next image is after we've taken that and we ingest it inside, we can actually separate different particle size. So we can take things that are down to the couple microns. We will sift those out, then we can deliver those to different instruments. Here's a picture of Mount Sharp. This is where we wanted to go It was an early picture. There's a rock that's out in the distance, that rock is 5-point-5 kilometers away from our Rover and it's approximately the same size as the Rover. And we are thinking, “Oh, my goodness, it would so great if we can make it there.” The other thing that you will notice in this image, if you are looking closely is there's clouds. Mars does have clouds just like Earth, right. So there is moisture in the atmosphere. So, this image shows sort of our trajectory to get down to the start of the mountain. And as we were driving we were starting to figure out, Oh, my goodness there's parts of Mars that are really, really scary. And the reason they are really, really scary is that the rocks that are on the surface are different than we have ever seen anywhere else on the surface of Mars. As we were driving on Mars with Spirit and Opportunity, we'd hit a rock and we'd break it or push it over and move it out of the way. In this particular area, the rocks are like cemented into the ground. And then they have this word, I don't know, I'm just going to use it, it's called Ventifacted rocks. In other words the rocks are wind-blown. So, if you can imagine you are covered with water and as the water recedes, the wind starts working on the rock and as it recedes, it sharpens the rock. So the rocks look like teeth. Very, very sharp teeth. And as we are driving over them, we are puncturing holes in the wheels. So, we thought, “Oh, my goodness, one, we have to figure how not to hurt our wheels, and number two, we have to figure out where to drive around things.” So, you can see we take sort of this really crazy path. And then we got to the place that's at the end of this particular image. And the scientists had a choice. We could go right, effectively right from the Rover's perspective and go through this area, right here, which is a choke point. There's really no way to get out if you get in there. Or we could go straight, very, very bad rocks. So we chose to go right. So we go right. We end up right we take some images of our wheels. We started to see lots of wear as we were driving over this area called the Hummocky Plains. And the hole that you see is, eh, sort of benign. The thing that's actually, really scary is the hole that's underneath that. And the reason it's scary as we are driving over the surface what we are going to do is the wheel is taking load, right, it's moving, it's actually getting stressed. And every time you do that you are actually having this crack propagate. And we were worried, “Oh, my goodness, how are the wheels going to fail?” These cracks are going to propagate across the wheel and then part of the wheel is going to fall off. And the part of the wheel that falls off is it going to hit anything that's bad? Because there's cables all around this. So, as the wheel falls apart, is it going to do this. So now what we are doing is selectively on different soils we are driving the Rover backwards. So, driving backwards actually takes a little bit of the load off the front wheels... about the same in the middle wheels, and then starts to do the damage to the back wheels. But that's okay because they are not damaged at all at this point. So we are going to start to try to even out the wear across the wheels so that we get a little bit of longer driving. So here's the image from the other side. Here's the video of us driving over that particular obstacle. Sort of fun. But it took us a while to do that. Then we have where we've gone. So we land at Bradbury, we go over to Yellowknife Bay. And now we are at the Pahrump Hills. Now the Pahrump Hills are more or less the gateway to Mount Sharp. Our first drill at Pahrump Hills. Now you can see it really sort of looks clayish. We do some close-up investigation, we can see these lines, looks like secretions. And hard stuff around it, the mineral that we believe that's there, and we were just doing some investigation right now, looks like hematite... which only forms in water here on Earth. So, it looks like we are finding another place that was really wet on the surface of Mars. And then we can talk about what's coming next. In 2020, we'll have a new Rover. You can see some of the science. The science suite has been announced. You can see the international collaboration that's going to happen. Very, very similar vehicle to Curiosity in terms of size, but has a different mission. And it's mission really is going to go sample the surface of Mars and capture the samples. And hopefully return them back to Earth. So, now as I close I'm going to show you some of my favorite images from the surface. This image is from Curiosity. And you see that star... that's out there? That's Earth. And in high-resolution you can see the moon. And now I'll show you my favorite video... my favorite image. This is from the top of Husband Hill. This is one of the last things that we got from Spirit. And if we had been able... had a little bit better camera, we could have seen Earth set. And I'll show you this as a video. And this is the Sun setting on Mars. And, the thing that makes me love this image so much is literally the fact that... some day a human being will stand on the surface of Mars and say, I am watching the Earth set and then I am watching the Sun set. And I can't wait for that day. Thank you guys so very much. It's been awesome.